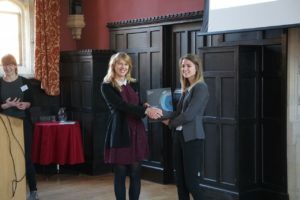 The 7th UK Solar Fuels Network Symposium was held at the University of Cambridge, UK on 28th – 29th February 2019. The meeting was chaired by Professor Erwin Reisner, director of the Solar Fuels Network. Chemical Science were proud to sponsor the meeting, alongside Energy & Environmental Science and Sustainable Energy & Fuels, which are other Royal Society of Chemistry journals. The meeting was an opportunity to bring together members of the Solar Fuels Network to meet up and discuss the latest advances in the field of solar-driven fuels research and provided an excellent opportunity for interaction with the rapidly expanding network of Solar Fuels researchers in the UK and beyond. The main meeting was followed by a half day post-graduate symposium at which PhD students and early career researchers had the opportunity to present their work. This meeting made up part of a larger ‘Solar Fuels Week’, taking place after the Artificial Photosynthesis Faraday Discussion and the Doppler Symposium. Congratulations to all of the prize winners from everyone at Chemical Science!